I think after Asian food, my favorite cuisines would be Mexican and Italian and the order varies depending on my mood. 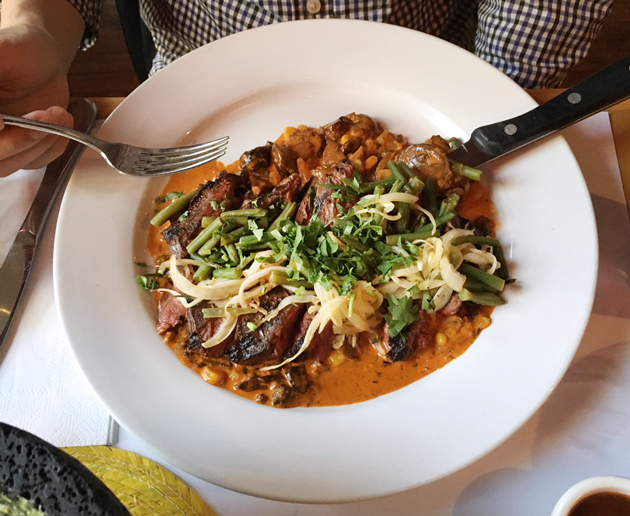 We're fortunate to have an ample number of both Mexican and Italian eateries in NYC that we like to explore. 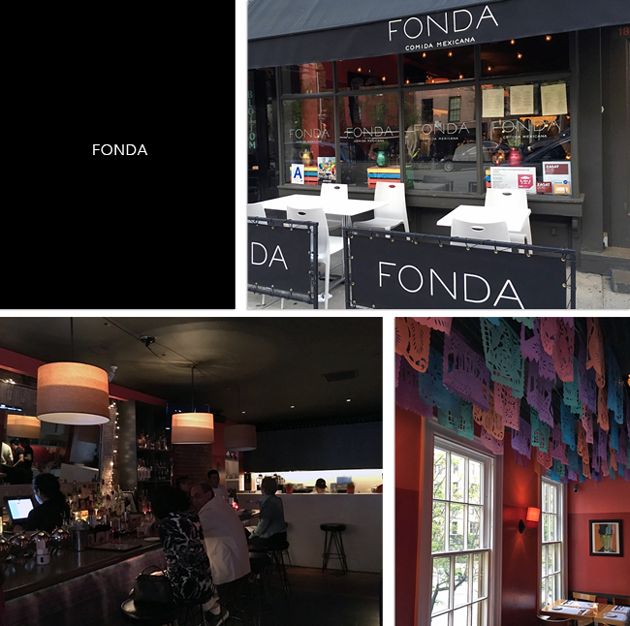 We recently visited Fonda, a two level eatery in Chelsea with a casual vibe. Guacamole is the de facto starter for us at any Mexican restaurant. It was made to order and arrived quickly at our table in a molcajete (a traditional Mexican version of a pestle and mortar) with hand pressed tortillas, chips and pasilla de Oaxaca salsa. The guacamole which wasn't fully mashed with chunks of avocado throughout (just how I like it!) was fresh, tasty and flavorful. Our entrées of Enchiladas Suizas and Carne Asada con Hongos were both good though a tad over seasoned and generously portioned. Though I suspect that is a matter of perspective because the people at the next table seemed to think their servings were small. Anyway we couldn't even finish our dishes. I don't usually like savory and sweet combinations but I quite enjoyed the Plátanos Fritos (sweet plantains) with cream and queso fresco. Hubby preferred the plantains straight up. We were seated upstairs and the service was a little slow because it seemed like there was only one server. I won't fault him because he was pleasant and really tried his best. The food was satisfactory but not particularly special or stand out in any way especially for what they charge. We dined there on a Gilt City voucher and this isn't a place that I'd be down to pay full price. Fonda also has locations in the East Village and Park Slope. Are you a fan of Mexican food? What's you favorite dish? Don't miss out on my latest giveaway! The prize is an assortment of Ciaté London, Julep, essie, Zoya, OPI & Lauren B. Beauty nail polishes and a nail art kit valued at $85! Enter here! 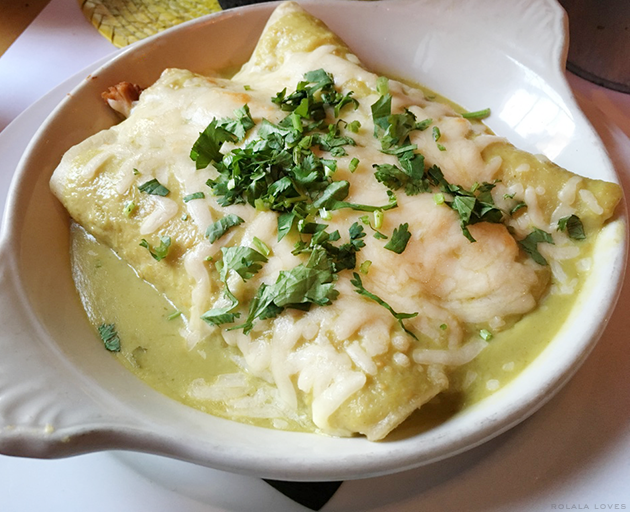 It's not easy to find great Mexican restaurants. The best Mexican food I've eaten was in Mexico City. Unfortunately I can no longer eat guacamole because I have discovered that I get stomach cramps from eating avocado :( Being a vegetarian, I can't eat at Chipotle either because their tofu is made of quorn and this gives me cramps too... Generally speaking, my favourite dish would be quesadilla, fried beans, vegetarian fajitas, you name it. Shame about the food, it looks pretty delicious to me but alas looks can be deceiving. I've been craving Mexican food since I came back. Australia doesn't seem to make it as good as you guys unfortunately. I am not that big on Mexican food, I much prefer Asian or Italian. And I don't like the combination of sweet and savory as well. But I am a big fan of dining out. Looks like a nice place to eat at, greetings! Sounds alright! Too bad about the slow service though, that's a shame. We just got back from Italy and man, we ate like PIGS! Best culinary experience so far for me, this trip! Italian cuisine is just sooooooo full of flavor and so tasty. I love sweet plantains I try them different way in my travel to Islands like Puerto Rico, Jamaica, Aruba but I never try them in a Mexican restaurant. Everything looks divine. I would like to try good mexican food... this place sounds interesting! The food looks so yummy! I should try Mexican food one of this day! Oh man! The pics have me drooling! I love Mexican food, and that guacamole...mmmm. Also loving that Platanos Fritos. Too bad that there was only one server though, and that the place was a bit pricey. such an amazing place to dine and relax. I first had Mexican food last year and it was delicious! Shame this eatery didn't quite hit the mark but thank goodness you guys didn't pay full price. Ah, there's nothing better than food arriving quickly to the table - though it's a pity the food didn't massively impress. All the same, you've got me curious about Mexican food! shame this wasn't the best, but i love reading your experiences on these places! The mexican food is my favorite my sweet Rowena. I love Mexican food but I haven't really eaten in a genuine mexican restaurant, I don't think we have them here. There are Mexican restaurants and I do like them, but I'm not sure as they good as a real thing. That's one cool thing about USA. You have so many different ethnic food dining options available. This place looks awesome. I would totally pay it a visit. Too bad about this place not being incredibly impressive, although Mexican food is probably my third favourite type of cuisine after Thai, and Indian food. I love fresh guacamole too, but tend to make it myself since it's so easy to do. Such a FAB place to dine! If you had not mentioned, the dishes do look good to me, but I guess when you take into consideration the value-for-money factor, then that would be a whole different story then, right? Hope you are enjoying your new week there in NYC! About Mexican food I have little experience, they use much spice in their dishes, I have only tried tacos! The dishes show us seems delish! This place looks and sounds amazing!